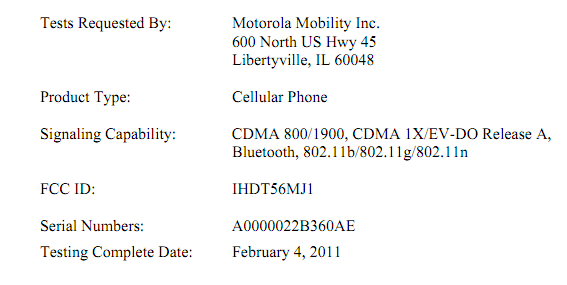 A sneaky little Motorola “Cellular Phone” showed up at the FCC recently, sporting a CDMA radio which has us thinking Verizon and DROID X2 rather than the DROID BIONIC, since there isn’t a mention anywhere of it having an LTE radio. We were originally expecting the DX2 some time in the first half of this year, possibly even in May, but after seeing the 180 day confidentiality letter included in this filing, that might no longer be in the plans. Maybe they’ll push it to July to match up with the original DX’s launch? And we saw some leaked pictures and specs of this phone a while back that have now gone under a lot of scrutiny, so we’re not sure what to think anymore. Dual-core or not? Front camera? Better screen? Any of that true? Anyone even interested?